no, i'm not dying right now. 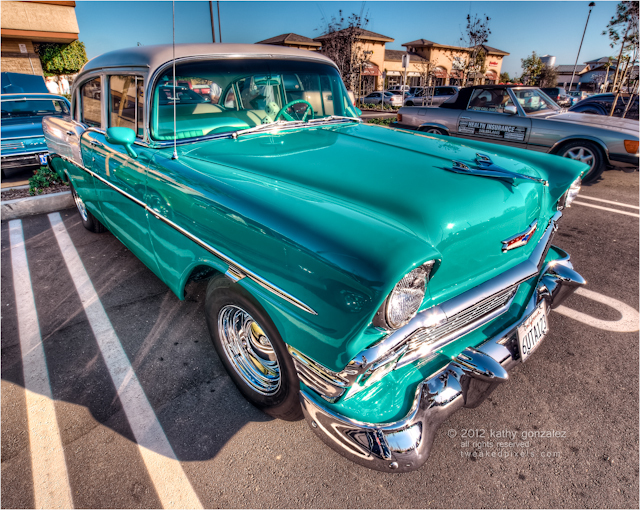 i was at the fuddrucker's in el toro the other day, trying to take a few pictures of some really spectacular mercuries that had pulled into the lot. minding my own business, lost in my car zen. zoning out after a day of work. an older couple came over to inquire about what i do with the pictures. told them i do it for myself, and post them on my blog. they walked away. five minutes later, the lady came back over and asked if i'd take a picture of their car. said she had some dying relative she was going to be visiting, and wanted to show him/her the car. ok, i'll take her word for it. it was a really nice car anyway. i wouldn't have shot it otherwise, because both the hood and trunk were up. i took several shots of it, but i think this one probably turned out best. sun was starting to go down, so the shots from the other side had too much of my tripod shadow in them, and i don't feel like retouching them. so here is the shot, and i think i'm done for the night. also, anyone who is stopping by here on the referral from my better half's blog, looking for macro shots, search here for hood ornaments, or over at my flickr site for more [search for hood ornaments or check out the flower set]. thanks for the shout out d.